Sugar's effects on weight management and your health aren't as cut and dried as you might think. Here's what the research really has to say! Having spent more than a decade in the fitness industry, I've seen every macronutrient demonized at various points. And the object of this demonization changes every few years. In the 1970s and '80s it was fat, with protein caught in that undertow as well. In the late 1990s and early 2000s, carbohydrates were demonized, a trend that's coming back around. Protein has gotten some new undeserved hatred again recently. And then there's the on-again, off-again battle that consumes other ingredients, such as dairy and gluten. Of course, everything that's out of favor at one point is revered as The Answer at another. Fat, protein, carbs, dairy—they've all been linked to health benefits and improved body composition. And you can easily find diets that uses those links to amp them up bizarrely, to the exclusion of almost everything else. But sugar...that's an easy one. Everyone these days seems to agree that sugar is bad with a capital B. It is the singular cause of the global obesity epidemic, and the first item you should cut from your diet...right? Turns out it's not nearly as simple as you probably think. Open your mind, and get ready for the sweet—and not so sweet—truths of the world's most popular sweetener. Let's start with the big guns. Research has associated high sugar intake with increased rates of obesity, heart disease, and cancer. [1-3] Many fitness and research professionals suggest reducing or eliminating sugar intake to optimize health and body composition. This seems logical at first. But the next question is the big one: Is it the sugar that does the damage, or the extra calories it brings? Because those calories can definitely be significant. A typical can of soda contains around 40-50 grams of sugar, and drinking two cans per day could increase your daily calories by a whopping 300-400. One can of soda has 150-200 calories and little to no nutritional value. What's worst about these calories is that they're basically empty. By this I mean that sugar has been shown to have very little effect on satiety, or how full you feel from the calories you eat. Taking in lots of extra calories but not getting full? You'd better believe that's a recipe for weight gain. But beyond the satiety argument, many people also believe that sugar in and of itself is more lipogenic (causes an increase in fatty-acid production and ultimately fat storage) than comparable calories from other types of carbohydrates. By this logic, some people recommend avoiding sugar by any means necessary. Further, in the last few years, popular documentaries claim that sugar is toxic and can contribute to health ailments. This one bugs me, because anything can be a toxin—it's the dosage that makes it poison. It would take a dose of 450 grams of sucrose to kill the average person. By comparison, a lethal dose of vitamin C is around one-third that dose, and a lethal dose of alcohol about one-fourth. So could sugar be toxic? In theory, yes—but you'd have to try pretty hard. Sure, correlation data supports the sugar-obesity relationship, but does the research data actually support the notion that sugar is more lipogenic than other forms of carbohydrate or calories? This is where things get murky. A 2001 study published in International Journal of Obesity followed overweight subjects whose diets derived either 10 or 5 percent of calories from sucrose. On a 2,000-calorie diet, this would be the difference between 50 and 25 grams of sugar per day. After eight weeks, there were no significant differences in weight loss or BMI. In fact, the high-sugar group lost about 1-1/2 pounds more, but this effect was statistically insignificant. This finding jived with a huge six-month study on more than 300 people, in which subjects demonstrated no differences in weight loss or body composition with a diet higher in sugar versus a diet lower in sugar—when calories, protein, and fiber were the same. There were limitations with these studies, mainly that they were "free living." That means participants were told what to do, and the researchers assumed they did it. Fortunately, a study published in the University of Minnesota's Journal of Nutrition was much more tightly controlled. For the first 12 weeks of the study, the participants had every meal they consumed prepared by the university, significantly reducing the probability of data interference. After the 12 weeks, the subjects were told to continue the diet on their own for 24 more weeks on their own. Each group lost the same amount of weight and body fat—regardless of how much sugar they consumed. Cutting sugar from your diet isn't a surefire way to lose weight. Admittedly, the difference in sugar intake between groups in these studies is pretty modest, but these results have been confirmed under extreme circumstances. One group of researchers found no difference in weight loss when people consumed 4 percent of their calories from sugar or 43 percent! That's more than 10 times more sugar in the high-sugar group: 11 grams versus 118 grams. When I saw this, I was shocked by the massive difference in sugar with no difference in weight loss. Finally, while differences in weight or fat loss do not appear to be different with varying intakes of sugar, what about weight gain? A year-long study in the International Journal of Obesity found no differences in post-diet weight regain with a low-sugar versus high-sugar diet. All this data suggests that differences in weight gain or loss result from more sugar and more calories overall, rather than sugar consumption specifically. If overall calories are controlled, there is no difference in fat loss. Even the most demonized of sugars, high-fructose corn syrup, has been demonstrated not to impede fat loss or improvements in blood lipids when calories are controlled. One criticism that might be leveled at this data is that most of it is done in obese people and not athletes or bodybuilders. Aha, you got me! Well, not really. Obese people often have compromised levels of insulin sensitivity and lower glucose tolerance, meaning they don't efficiently handle glucose compared to an individual with greater insulin sensitivity. If anyone would be unable to lose weight on a diet higher in sugar, it would be these individuals. Athletes and active people generally have significantly improved levels of insulin sensitivity and glucose tolerance compared to the average population. Therefore, even if sugar was inherently more lipogenic—which it's not, based on the data just presented—athletes and those who engage in resistance training would be the people best-equipped to tolerate it. Athletes and very active people are better able to tolerate sugar's impact on insulin and glucose. Fortunately for those of us with a sweet tooth, it seems sugar can be tolerated by most people when overall calories are controlled. Low-sugar diets (11 grams per day) were associated with slightly more benefits to cholesterol and blood lipids compared to very-high-sugar diets(118 grams per day). Yet this effect was so small—less than 10 percent difference between groups—that the authors questioned its significance. Some people will also counter that since all carbohydrates, excluding fiber, turn into sugar in the body, low-carbohydrate diets will produce superior fat loss and health compared to higher-carbohydrate diets. However, a study performed at the University of Arizona compared an isocaloric low-carbohydrate diet to a moderate-carbohydrate diet equal in protein. Over six weeks, both diets produced the same amount of fat loss. Furthermore, markers of inflammation were lower in the moderate-carb group than the low-carbohydrate group. By now, I'm sure many of you want to burn me at the stake for nutritional heresy. However, the data suggests that sugar isn't the demon many of us have been led to believe. It can be incorporated into a healthy diet, and you can still lose fat and progress towards your goals. But it does come with several drawbacks. In small doses, sugar doesn't have to be detrimental to weight loss. Just eat it in moderation. First, it's definitely not very filling, so it can be easier to overeat than more fibrous foods. Additionally, if you are dieting for a show and are low on calories, it's going to be hard to make sugary foods fit into your macronutrient goals while still consuming enough fiber. Always keep this in mind! Put another way, if you're a 120-pound bikini competitor consuming less than 100 grams of carbohydrates per day, it's probably not appropriate to get over half of those carbs from sugar. Sugar has a smaller impact on satiety than low-GI (glycemic index) carbohydrates, and when food is low, hunger will already be high. This further worsens the situation. But if you have a good metabolism, you're in your offseason, or you're consuming a lot of calories, there's no reason you can't incorporate a reasonable amount of sugar into your diet and still progress towards your goals. Too much of anything is bad—and sugar is definitely included here. But if you keep your approach balanced and thoughtful, you don't have to cross anything off the menu. For more information on how to incorporate your favorite foods into a sustainable lifestyle but still progress toward your goals, visit Layne's new venture at avatarnutrition.com. Stanhope, K. L. (2015). 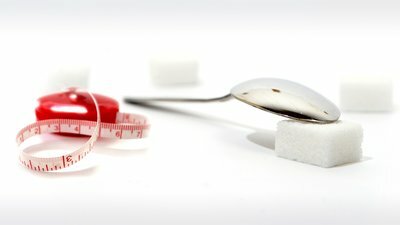 Sugar consumption, metabolic disease and obesity: The state of the controversy. Critical Reviews in Clinical Laboratory Sciences, 1-16. Yudkin, J., & Watson, R. H. (1969). Sugar and ischaemic heart disease. British Journal of Medicine, 4(5675), 110-111. Sulaiman, S., Shahril, M. R., Wafa, S. W., Shaharudin, S. H., & Hussin, S. N. (2014). Dietary carbohydrate, fiber and sugar and risk of breast cancer according to menopausal status in malaysia. Asian Pacific Journal of Cancer Prevention, 15, 5959-5964. West, J. A., & De Looy, A. E. (2001). Weight loss in overweight subjects following low-sucrose or sucrose-containing diets. International Journal of Obesity & Related Metabolic Disorders, 25(8). Saris, W. H., Astrup, A., Prentice, A. M., Zunft, H. J., Formiguera, X., Verboeket-van de Venne, W. P. H. G., ... & Vasilaras, T. H. (2000). Randomized controlled trial of changes in dietary carbohydrate/fat ratio and simple vs complex carbohydrates on body weight and blood lipids: the CARMEN study. International Journal of Obesity, 24(10), 1310-1318. Raatz, S. K., Torkelson, C. J., Redmon, J. B., Reck, K. P., Kwong, C. A., Swanson, J. E., ... & Bantle, J. P. (2005). Reduced glycemic index and glycemic load diets do not increase the effects of energy restriction on weight loss and insulin sensitivity in obese men and women. The Journal of Nutrition, 135(10), 2387-2391. Surwit, R. S., Feinglos, M. N., McCaskill, C. C., Clay, S. L., Babyak, M. A., Brownlow, B. S., ... & Lin, P. H. (1997). Metabolic and behavioral effects of a high-sucrose diet during weight loss. The American Journal of Clinical Nutrition, 65(4), 908-915. Aller, E. E., Larsen, T. M., Claus, H., Lindroos, A. K., Kafatos, A., Pfeiffer, A., ... & Saris, W. H. M. (2014). Weight loss maintenance in overweight subjects on ad libitum diets with high or low protein content and glycemic index: the DIOGENES trial 12-month results. International Journal of Obesity, 38(12), 1511-1517. Lowndes, J., Kawiecki, D., Pardo, S., Nguyen, V., Melanson, K. J., Yu, Z., & Rippe, J. M. (2012). The effects of four hypocaloric diets containing different levels of sucrose or high fructose corn syrup on weight loss and related parameters. Nutrition Journal, 11(1), 1. Phielix, E., Meex, R., Ouwens, D. M., Sparks, L., Hoeks, J., Schaart, G., ... & Schrauwen, P. (2012). High oxidative capacity due to chronic exercise training attenuates lipid-induced insulin resistance. Diabetes, 61(10), 2472-2478. Johnston, C. S., Tjonn, S. L., Swan, P. D., White, A., Hutchins, H., & Sears, B. (2006). Ketogenic low-carbohydrate diets have no metabolic advantage over nonketogenic low-carbohydrate diets. The American Journal of Clinical Nutrition, 83(5), 1055-1061.